Partner with Revolution Shakespeare and forge a connection to our local professional productions, to create a fun accessible approach to the Bard! Revolution Shakespeare has had fantastic success revolutionizing Shakespeare in public and charter schools from 2013 to today! We dispatch professional theatre practitioners to classrooms and assemblies around Greater Philadelphia to provide a positive, insightful, and artistic approach to a Shakespearean repertoire. We work with each school’s schedule, curriculum, budget, and students’ skill level, to create a tailored, focused experience from middle school to college. 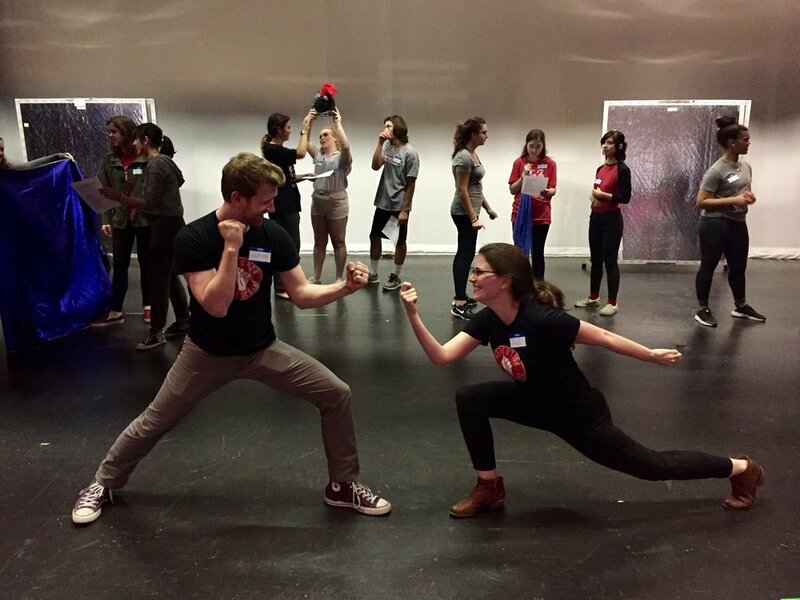 At these schools, creativity is sparked, stage combat is practiced and a new love for Shakespeare is born. We work with some amazing schools! Every school we have worked with continues a relationship with us– a true testament to our work. The Baldwin School, Central High School, Haverford, and Project Learn School have all embraced and financially supported our workshops, and will continue to do so in the future. Along with our in-class presentation, we provide digital study guides to help teachers introduce the play and bring the text alive through activities and dramaturgical analysis of characters, culture and themes using music, history and visual art/design components. Thanks to a generous grant from the Wyncote Foundation, Revolution Shakespeare is fulfilling its commitment to bringing the Bard's work to life in schools, public readings, and performances. 8th graders at Upland Country Day School explore Shakespeare's best literary insults with Revolution Shakespeare. Artistic Director Griffin Stanton-Ameisen and Education Director Jessica DalCanton warm up with students at Haddonfield Memorial High for a Snowday Shakespeare workshop. 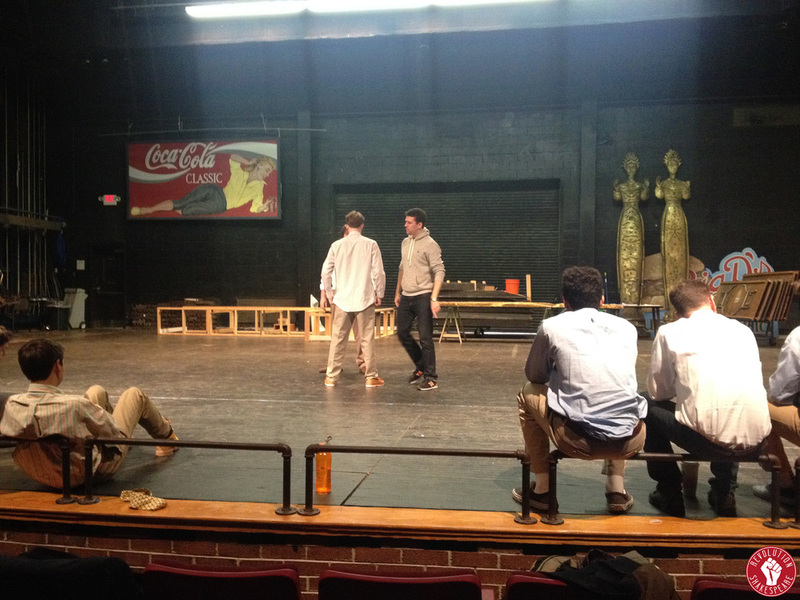 Artistic Director Griffin Stanton-Ameison and Associate Artistic-Director Jared Delaney working with students during RevShakes' Hamlet residency at the Baldwin School. Photography by Katie Brogan Ozeck. Central Students modernize the 9 worthies in our customized Love's Labour's Lost workshop. Artistic Director Griffin Stanton-Ameisen and Education Director Jessica DalCanton pose with students at The Baldwin School, following a successful Shakespeare workshop. Resident Fight Choreographer Sean Bradley walks students through stage combat techniques at The Haverford School, during a Revolution Shakespeare workshop.